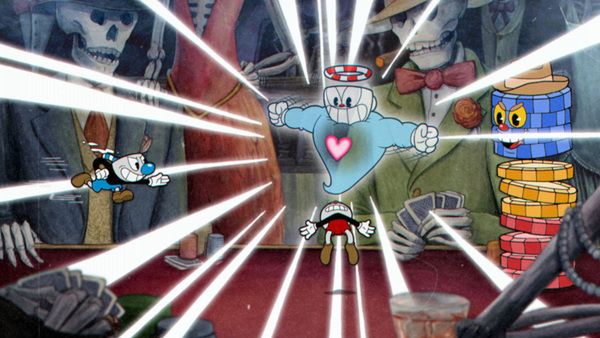 Even though we've had a few days to let the news settle, most Nintendo and Microsoft fans are still shocked to see Cuphead come to Switch. The love affair between Microsoft and Nintendo has been growing stronger with each day, but this announcement takes things to the next level. Moldenhauer is feeling the same things all other fans are. I feel that including an easier mode or an invinsible character is a great way to let gamers of all ages and skill level enjoy your art. I will unfortunately have to pass on this game because my gaming time is spent with my wife, who gets frustrated having to slug through the same section multiple times and my children, who don&apos;t have the dexterity for fast button presses. Halo games are now on Steam & Castle Crashers Remastered is going to PS4. Yet we think Microsoft and Nintendo have a "marriage". yep easier mode like incredibly easy , please it&apos;s not like anyone is going to brag or annoy people with it. It&apos;s just for people who do not read those blogs . No one here is ever going to play with the rabbit or funky. Make it an hour based unlock like team ninja did way back. Heck that&apos;s why we have the konami code even ! anyway, I&apos;m still going to buy it, but I would like to enjoy it with friends. I feel like an easy mode would be a good thing to add. A lot of people will not be able to experience the game due to its difficulty. Celeste says hello! Difficult games are ultimately more rewarding. Celeste says hello! Difficult games are ultimately more rewarding, imho. Asking for an easy mode of Cuphead is like asking for an easy mode of Dark Souls. Then you look at Nintendo&apos;s platformers and how easy they are for the most part, until the last few levels. Or how they&apos;ve made ports even easier, e.g. Wii U&apos;s NSMBUD and DKC: TF on Switch. They even added steering assist to MK8D for crying out loud. That&apos;s how nerfed things have become. Next you&apos;ll know, if they re-release Wii Bowling again, expect bumpers to be on as the default setting. Edit: Thanks predictive text. The irony.